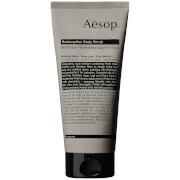 Exfoliate your body with the Aesop Geranium Leaf Body Scrub. Fragranced with the aroma of geranium, this body scrub is expertly blended with pumice and bamboo stem to remove dead surface cells. A range of botanical oils including bergamot and mandarin peel purify and calm the skin leaving it feeling polished and soft. Directions for use: Use twice a week. Wet skin; dispense the geranium leaf body scrub onto a sea sponge. Massage the scrub into your body from neck to toe. Pay particular attention to dry areas such as elbows, knees and feet. Rinse thoroughly. 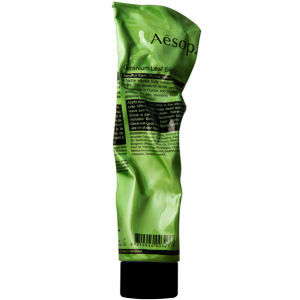 For best results, follow the scrub with your favourite Aesop skin hydrator. Geranium Leaf Oil - Disinfects and purifies the skin. Bamboo Stem and Pumice - Has a soft abrasive action to gently exfoliate the skin without scratching. Mandarin Orange - Helps to purify and re-balance the skin.